A little rock and roll offers some comfort to professional bass angler Janet Parker. Mick Jagger wrote and sang it with the Rolling Stones, and Parker can relate: You can't always get what you want. In Parker's case, it was a strong finish in the third tournament of the Bassmaster Central Opens and an Elite series invitation for next year. A dream that will have to percolate a bit more during the off season. Parker has decided one thing in the days that followed the disappointing tournament at Table Rock. "I'm definitely going to try again next year," shared Parker. 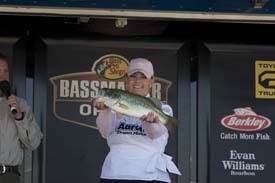 She plans to fish the Bass Pro Shops Bassmaster Central Opens again and feels she has a greater advantage in 2012 because of the favorable schedule. The first event is on Parker's home waters-Lake Lewisville in Texas. Table Rock comes back into play and Parker had quite a bit of pre-fish time there between the cancelled spring tournament then the fall re-scheduled event. "I'm glad to have had a lot of time on the water on Table Rock this year," added Parker. "That will definitely help me in 2012." And the third tournament is on a lake that is close to her family-Fort Gibson Lake in Oklahoma. "Having a family connection to Fort Gibson will make it a little easier for me to scout out the lake next year. I'm excited about competing with this schedule." This chick-that-can-fish ended up in 20th place for Angler of the Year. "Janet should definitely hold her head high," shared Bart Schad, VP Marketing with Ranger Boats. "She accomplished a lot this year and we're sure she'll devote the time and practice to be ready for the 2012 season. She's proven herself in our book." In fact, Parker has already earned more tournament purse through B.A.S.S. than more than ten anglers that fished the Elite series in 2011. Running the iconic Aaron's Dream Machine-a Ranger Boats fishing version of the more notorious Nascar Aaron's Dream Machine race car driven by David Reutimann, Parker's wrapped boat is super-identifiable. Even Lucky, the Aaron's mascot joined Parker on stage in Branson for the weigh in. "All of us at Aaron's are proud to have Janet represent Aaron's," shared Rich Lamprey, Director of Sports Marketing for Aaron's. "Janet's performance this year was spectacular. We always say 'Nobody Beats Aaron's' so we know she'll be back next year for another run at it." Parker entered the world of professional bass fishing in 2005 after a career in medical science. She won two regional tournaments that first year, and moved up into the Women's Bass Tour. She won her first WBT tournament in April of 2009 on the Ouachita River and moved into the Bassmaster Open series in 2010. She has five top-ten finishes in the Bassmaster series. Janet Parker's sponsors include Aaron's, Evinrude E-TEC outboard engines, Ranger Boats, Humminbird, Minn Kota, Rapala and Dobyn's Rods. For interviews, sponsorship or public appearances for Janet Parker please contact Kristine Houtman with Liddle Marketing Company at 612-710-5584.